Barris, Ted. "Steamboats and Paddle Wheelers". The Canadian Encyclopedia, 04 March 2015, Historica Canada. https://www.thecanadianencyclopedia.ca/en/article/steamboats-and-paddle-wheelers. Accessed 23 April 2019. Demonstrated in France on the Saône River in 1783, the paddle-wheel steamboat first appeared in North America for use on the Delaware River in 1787. After inauguration at New Orleans in 1811 by Robert Fulton, hundreds of boats worked the Mississippi River system between 1830 and 1870. 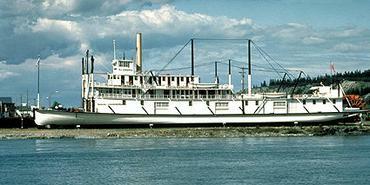 An old paddle steamer used in the Yukon by the gold miners of the last century (courtesy Colour Library Books Ltd.). 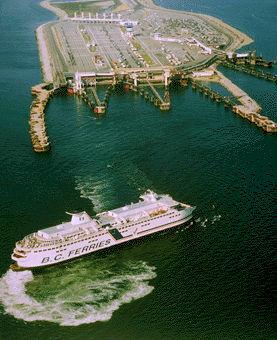 Steamboat refers to the flat-bottomed, shallow-draft, steam-powered vessels, generally associated with inland navigation, as opposed to deep-keeled, oceangoing steamships. As invented in 1685 by French physicist Denis Papin, the paddle wheel (driven by compressed steam from wood- or coal-fired boilers) was affixed to the boat hull either laterally (side-wheeler) or at the rear of the boat (sternwheeler) and provided forward and reverse propulsion. Demonstrated in France on the Saône River in 1783, the paddle-wheel steamboat first appeared in North America for use on the Delaware River in 1787. After inauguration at New Orleans in 1811 by Robert Fulton, hundreds of boats worked the Mississippi River system between 1830 and 1870. The first paddle steamer in Canadian waters, the ACCOMMODATION, was a side-wheeler launched for a 36-hour maiden voyage from Montréal to Québec in 1809. Other paddle-wheel steamboat firsts in Canada include the Frontenac on Lake Ontario (1816); the General Stacey Smyth on the Saint John River (1816); the Union on the lower reaches of the Ottawa River (1819); the Richard Smith visiting PEI (1830); the ROYAL WILLIAM steaming from Québec to Halifax (1831); the seagoing BEAVER, which first plied waters off BC (1836); the Spitfire, first steamboat into St John's harbour (1840); and the ANSON NORTHUP, first paddle wheeler to cross the international boundary on the Red River (1859). Paddle steamers figure significantly in Canadian history. The Swiftsure moved troops on the St Lawrence during the War of 1812. The Royal William, built at Québec, was the first vessel to cross the Atlantic almost entirely under the power of steam in 1833. 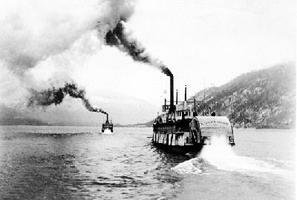 BC steamers ferried thousands of gold seekers into the Fraser (1858), Cariboo (1862) and Yukon (1898) river valleys (300 steamboats worked BC and Yukon waterways between 1836 and 1957). 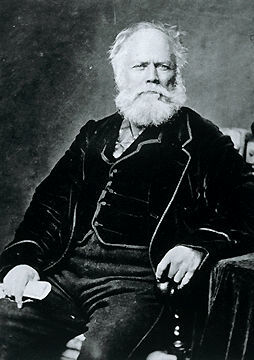 The Red River steamer International was commandeered by the forces of Louis Riel at Fort Garry in 1870; and the Saskatchewan River stern-wheeler Northcote engaged Gabriel Dumont's Métis at the Battle of BATOCHE. 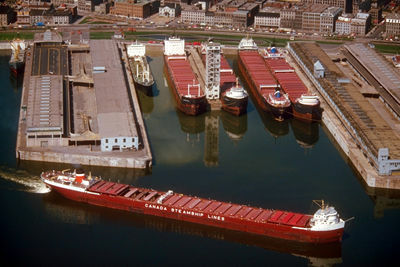 Paddle steamers carried the first wheat exported from Manitoba, precipitated a sophisticated inland canal and lock system in Ontario, freighted the first locomotive to Winnipeg for the CPR, brought the first mail to the Klondike and ferried the first fresh fruits and missionaries into the Far North. The utilitarian steamboat was also a social force. Staterooms, grand pianos and fine wines came with first-class passage aboard even the frontier steamers, and cabin and boiler decks below had fiddle playing, folk dances and card games. After 1900, when railways replaced steamboats as the major means of freight transport, hunting and picnic excursions and moonlight cruises were commonplace aboard steamboats. The last fully operational stern-wheeler, the Samson V (built in 1936 for use on the Fraser River), was taken out of service in 1981. Stern-wheelers still operate, or are displayed, at various historic sites and attractions. In the Yukon, the steamer Keno, which transported silver, lead and zinc ore between Stewart City and Mayo Landing in 1922, has been preserved to commemorate the mining history of the Yukon Territory. The Keno now occupies a berth in Dawson City. In Edmonton, the Edmonton Queen cruises along the North Saskatchewan River, treating passengers to a scenic view of the river valley. Ted Barris, Fire Canoe: Prairie Steamboat Days Revisited (1977); Peter Charlebois, Sternwheelers & Sidewheelers, The Romance of Steamdriven Paddleboats in Canada (1978); Art Downs, Paddlewheels on the Frontier; The Story of British Columbia and Yukon Sternwheel Steamers (1972).